This past week my wife took a day trip with the kids. I was able to enjoy a silent Sunday. It was wonderful. Now, don’t get me wrong…I love my wife, I love my kids. I love spending time with them…but I long for days of silence. Before marriage and kids I had many of them. These days, not so much. I wouldn’t go back if I could. But still deep within my soul, I long for days of quiet…days of rest…I know I’m not alone. 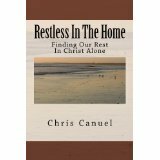 This longing, or better yet, this need for rest…was God’s idea. The Sabbath is meant to be a beautiful gift of rest to God’s people. A time to get away from the slavery of activity that we are all so subject to…Not only that, but the Sabbath is meant to be a reminder of the rest that we all have in Christ. Now I’m not talking about a legalistic approach. I’m not talking about counting steps to and from places to define what is work. I’m not talking about not being able to cook, flip on a light switch, or leave your home. That is silliness, and completely contrary to the idea of Sabbath. These things are just work redefined. But sometimes…we need the solitude. Sometimes we just need a break. Again, I think it is a part of the natural order of things. We were made to long for this. So, why do we feel so guilty for it? Why do I feel so guilty for it? Why am I made by others to feel guilty for it? Why do people question me when I talk about these things? Now, work is good…and is certainly a part of the natural order of things. BUT, there is also a time to take a break. There is also a time to relax. Part of the beauty of the Sabbath is that we stop worrying about our needs and our own self dependence, and give those over to God and allow Him to provide. It is an exhibition of faith. Silence is a gift from God…a chance to listen to God… I long for that. Solitude is a gift from God…a chance to be with God…I long for that.